When renewing the control unit, select Renew function for the respective control unit in Guided fault finding or Guided functions mode → Vehicle diagnostic tester. The removal and installation procedures are described for LHD vehicles. Removal and installation for RHD vehicles are similar. – Remove footwell cover on driver side → General body repairs, interior; Rep. gr.68. – Remove knee airbag with igniter → General body repairs, interior; Rep. gr.69. – Press bracket -2- of interface for entry and start authorisation system -J965--1- at top in direction of arrow -A-. – Remove interface for entry and start authorisation system -J965--1- from bracket -2- in direction of arrow -B-. – Disconnect electrical connector -3-. 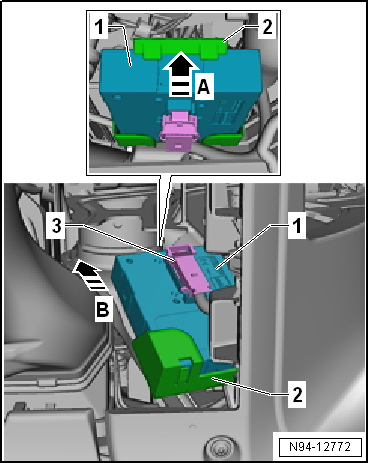 – Press locking detent -1- to disconnect connector. – Swing retainer in -direction of arrow- and pull off connector. – Lever out catch -1- in -direction of arrow A-, using a narrow screwdriver if necessary. – Remove bracket -2- from support -3- in direction of arrow -B-. – Ensure that bracket for interface for entry and start system -J965- engages audibly. 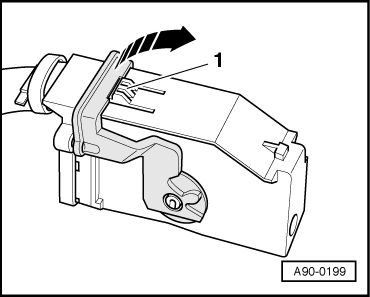 – Ensure that interface for entry and start system -J965- engages audibly in bracket. 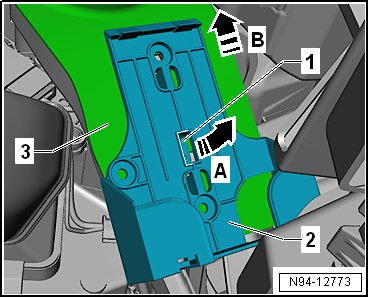 The driver door exterior handle contact sensor -G415- or front passenger door exterior handle contact sensor -G416- is integrated in the respective exterior door handle and cannot be renewed individually if defective. – Removing and installing door handle → General body repairs, exterior; Rep. gr.57.